HOT WING MINI CAKES are the perfect appetizer bites full of chicken, sauce and all the hot wing goodness. The panko crust emulates the crispy wings you love! 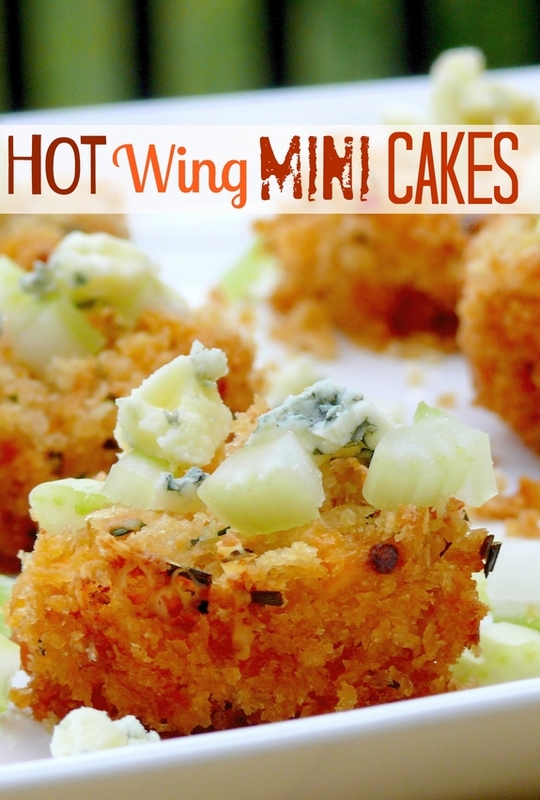 These little Hot Wing Mini Cakes have been on my mind since I had a version of them here. They were so, so good and I couldn’t wait to create a version of them on my own. I’ve always been a bit of hot wing junky. I love the spicy and tangy flavors that come together with a pungent blue cheese. It’s magical. Each one of these bites is a bit of food heaven with incredible flavor. I have no doubt, these will be your “go to” football food this season and regular party food from now on. I promise. When I enjoyed a version of these Hot Wing Mini Cakes the first time, they were in tiny pastry shells filled with the chicken mixture. I would have loved to use these little pastry shells, EXCEPT you can not buy them in my town. I suppose we are not fancy enough in our part of wine country to have them. This is why I came up with my own version for a pastry shell. What came to mind was the crust I used for my Mini Crab Cakes. They are just completely awesome and I thought the same crust would be the perfect little nest for the chicken, sauce and all the hot wing goodness. The crispy panko crumbs would strongly emulate crispy wings and the perfect choice for these little bites. And because they are made in a mini muffin cup pan, it really does make them the perfect bite-sized treat. As it turns out, I was right about the taste and texture. So right in fact, I did a little victory dance in the kitchen after my first bite. The taste definitely makes you do one of those, “throw your head back and swoon” type moves. You know the one. Now, while we are not fancy enough to have the pre-made pastry shells in my town, we are fancy enough to be surrounded by some amazing artisan cheese. Namely, this Rouge Creamery Oregon Blue Cheese you see above. The flavor of a good blue cheese is unparalleled. This recipe screams for an over-the-top pungent blue, not those blue cheese crumbles in the grocery store fridge. 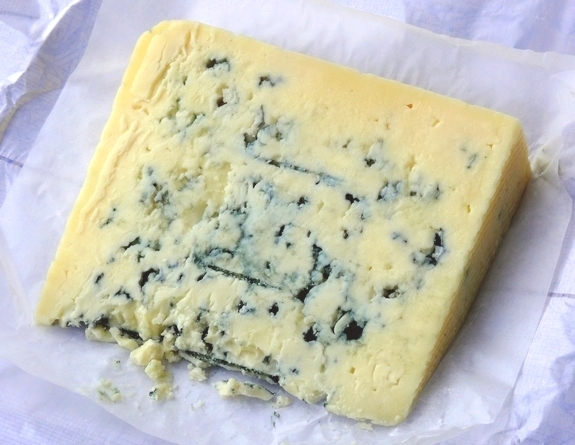 Get the best blue cheese you can afford, it really stands out. These little one bite wonders are going to be your favorites. Serve them at your next gathering. Who doesn’t love a good appetizer for a party and there are so many to choose from. I personally love this these Antipasto Skewers for convenience! And these Garlic Chicken Puffs are the perfect party food. Jalapeno Popper Dip is always popular and so are Mini Potato Skins. Two years ago I made this Quick Chicken Marengo served over Cheesy Lemon-Pepper Polenta and it was fabulous! Three years ago this Feta Pepper Dip became a party favorite. In a large bowl, combine chicken, hot wing sauce, cream cheese and 4 oz of the blue cheese. If the cream cheese is room temperature, this will be really easy. Set aside. Preheat oven to 350 degrees. Spray mini muffin pan with nonstick spray. Toss panko, Parmesan and chives in a bowl. Drizzle melted butter over, crumb mixture, tossing with a fork until evenly moistened. Press 1 rounded Tablespoon panko mixture into bottom of each muffin cup (make a well with your thumb), forming crust. Spoon 1 generous Tablespoon chicken mixture into each cup. Sprinkle more panko mixture over each. Bake hot wing cakes until golden on top and set, about 20 minutes. Cool in pan 15 minutes, do not rush this, they will fall apart if you try to move them too soon. Gently lift each cake out of the pan with a small fork onto a serving platter. Sprinkle with the last 4 ounces of blue cheese and diced celery. Looks delicious and I’ll try it …. but mmmm …. got a little confused with chicken and crab cakes at the end! As good as crab could be with almost the same exact recipe, I think I’ll go for the wings instead of the claws :o). The crab cake mention has to do with using the same crust as I used in the crab cake recipe. I’m allergic to Blue Cheese, what could I substitute for it please? Blue cheese is particularly assertive and classic with Hot Wings, so you will want to substitute it with another strong tasting cheese. Feta might work well; the texture is similar and it is fairly pungent. Use Gorgonzola if you can’t have Blue Cheese, it’s a great substitute. Cathy, these little babies are going to be a huge hit over here! My Hubby loves hot wing sauce so he will flip over these cakes! Thank you for sharing! Have a fabulous Sunday! Thanks Anna, happy Sunday to you as well. This is awesome, Cathy! I love wing sauce, I need to try Saucy Mama’s! It is really is one of the best I’ve tasted. Holy cow! These are going to be on my football-game-watching menu next weekend. I can’t wait! Do you really mean just 3 chicken thighs? That’s hardly any chicken compared to the volume of cheeses and sauce. The combination of flavors sounds beyond to-die-for. Any suggestions for an alternative to Saucy Mama’s hot wing sauce? Everything else is just down the street (or already on hand) to make these today! Three is correct, these are made in mini muffin tins so it is plenty. Also, as far as the sauce, you could use Frank’s Buffalo Wing Sauce but it won’t have the intensity and flavor of the Saucy Mama. I’ve been dreaming of the Saucy Mama Hot Wing Sauce since the Barhyte party last month! I love crispy texture of Panko and have been in a rut of just using it in a Chicken Katsu recipe. Thanks for the inspiration. Your cakes are gorgeous! Thanks Frieda, they were so good! I hope all is well in Bellingham! Also do join my party. I am hosting a gala dinner extravaganza, a fabulous linky party for all. It’s going to go on for the entire weekend. You can post anything – appetizers, drinks, soups, stews, desserts, finger foods – anything that takes your fancy. These would be a huge hit at my house! This might be a silly question, but is the diced chicken already cooked or raw? Bookmarked these to try and can’t wait. Silly question, are the chicken thighs cooked beforehand or is that raw chicken that’s baked with the pannko? Cathy…you have the best blog ever. I have made so many of your recipes and they have all been a big hit. I made these for a belated Christmas family dinner and they were fabulous. I used a wing sauce from a local store. Thank you so much for all your great recipes!!!! Substitute Pork Rinds (crushed) for the Panko! Yes that’s good if you’re doing keto diet or low carb in general.